I sometimes find myself watching late night infomercials with a kind of bemused fascination. Who are these people who can’t drain pasta without getting it all over the kitchen? Why do they have so much difficulty shelling an egg? How many people do you know who routinely feel the need to cut up old shoes with a kitchen knife? And would they really go from cutting a tin can to slicing a tomato without pausing? And frankly, the thing that makes omelets for you looks far more complicated than even the most temperamental frying pan. I have criteria for my kitchen toys. (a) I have to have somewhere to put them. This seems obvious, but frankly if I didn’t live by this rule I’d buy something every time I walked into a kitchen store. There’s a set of 12 individual tartlet pans I keep eying at Bed, Bath & Beyond which I absolutely do not need and will never use, and yet the only thing stopping me is that I have nowhere to put them. (b) They can’t be more trouble to clean than they are to use. Given a choice between washing something that has five parts and washing a knife and a cutting board, I’ll take an extra five minutes and do whatever it is the old fashioned way. I love my cuisinart, but I don’t use it to chop three cloves of garlic. (c)They have to either do something I can’t do another way, or genuinely make my life easier. Most of the time my ice cream maker sits in a cupboard, but when I periodically remember that I own it it’s lovely to be able to make spectacularly rich ginger ice cream. Likewise, most of the time my cuisinart sits on the counter taking up space but when I need to grate a pound of cheese for macaroni & cheese it’s wonderful. 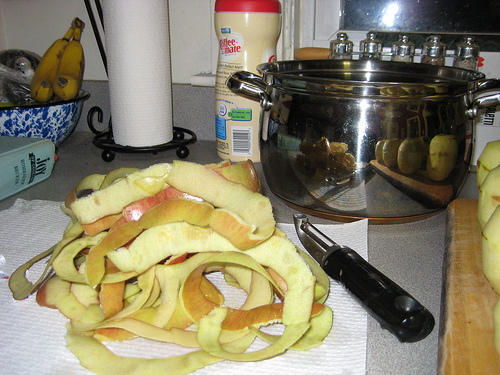 Thus, I don’t own popsicle molds (a), an onion chopper (b/c), an apple peeler (a/c), or an egg separator (c). Actually this Christmas I proved that I am less likely to be able to separate an egg if I use the gadget designed for the purpose than I am if I just use the egg shells or my hands. 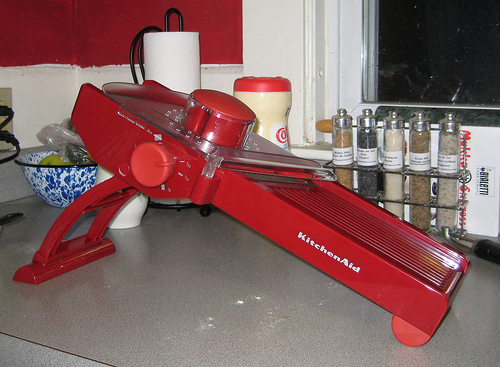 Then there are the kitchen toys that I covet but can’t quite justify buying for myself, like, say, a mandolin. I don’t strictly speaking need a mandolin. Most of what it can do I can replicate with time, a knife and a cutting board. But wow, making scalloped potatoes is so much easier with a mandolin, and prettier than slicing them in the cuisinart. The mandolin is not an example chosen at random. My roommate’s parents gave me a one for Christmas. It came in a cheery red color, which makes it even more exciting. The scalloped potatoes for Dinner were just an excuse to take it for an inaugural slice. I have to say, it lived up to the hype. Having sliced my potatoes I then glanced around my kitchen for a while before regretfully deciding that there really wasn’t anything else that needed to be, or even could be, sliced that evening. But, there are sliced grilled vegetables in my future. Possibly home made French fries, and possibly even non-party related cucumber sandwiches. Peel and then slice your potatoes about 1/8” thick. I used my pretty new mandolin to do it, but failing that the slicing attachment on a cuisinart works well, or a steady hand and a knife will do it too. Although I have to say, before I realized that I could slice potatoes in the cuisinart I almost never made scalloped potatoes because my knife skills aren’t up repeatedly achieving 1/8” slices of potato. 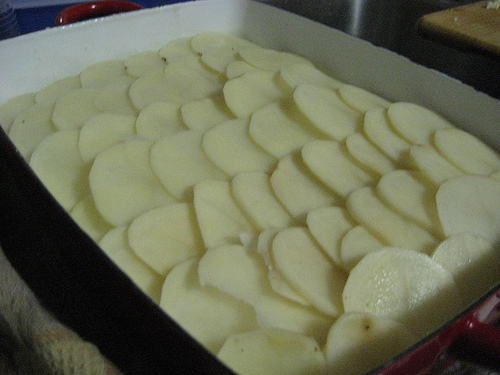 Arrange one layer of potatoes in the bottom of a greased casserole pan, overlapping them decoratively. Sprinkle with some of the flour and dot with some of the butter. How much butter and flour you use per layer will depend on how many layers you are doing, but you want about the same amount for each layer. Repeat the layering process until you have used up all your potatoes. Notes: I made about 2.5 times the recipe to feed 6-8 people. I used between 7.5-8 cups of sliced potatoes (which translates to about 5 large potatoes) and made 4 layers. I make my scalloped potatoes in a 9×13” pan and find that 2 cups of sliced potatoes will cover one layer. I use about 1.5 Tbsp flour and 2 Tbsp butter per layer. This isn’t baking, so if your proportions aren’t exact the recipe will still work. Heat the milk and then pour over the potatoes. I use the highly unscientific method of sticking my pinky in the milk to see if it’s hot enough (just don’t lick your finger afterwards, salty milk is revolting). When it’s hot enough to be just on the other side of uncomfortable I take it off the heat. If this isn’t something you feel like doing, you can heat it until it is just about to come to the boil – but don’t let it boil. Bake in a 350 oven for 30 minutes covered, and then remove the cover and continue to bake for 1 hour. Notes: If I tried to do all of this on Wednesday night after I got home we wouldn’t eat until about 9pm. But, I’ve discovered that you can bake the scalloped potatoes halfway one night, and then finish baking them the next night. 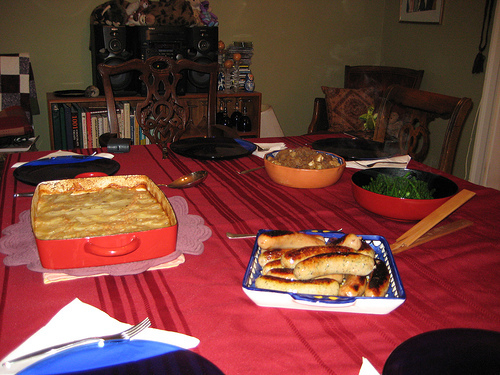 I made the scalloped potatoes on Tuesday evening and baked them covered for 40 minutes. On Wednesday night I removed the cover and baked the potatoes for the remaining 50 minutes. You can add other things to your scalloped potatoes if you so desire. I’m a purist and I really like just the starch/dairy combination. But, if you like you can add some thinly sliced onions in between the potato layers, and/or grated cheese divided evenly between the layers. If you add cheese you definitely want to use the lesser amount of butter or the whole thing will be greasy. * Yes, yes I know. It’s out of season and imported from who knows where, but I’m tired of green beans and broccoli. they’re faster than ice cream! healthier! take up less space in the freezer! also, if you get the individual ones that can stack together like cups, they’re soooooo storeable. clearly Jen needs to throw another Tupperware party so you can buy some. Have you seen my freezer? . . . . . and yet, I’m tempted. thank you so much for the scalloped potato recipe. i have been looking for one like this. 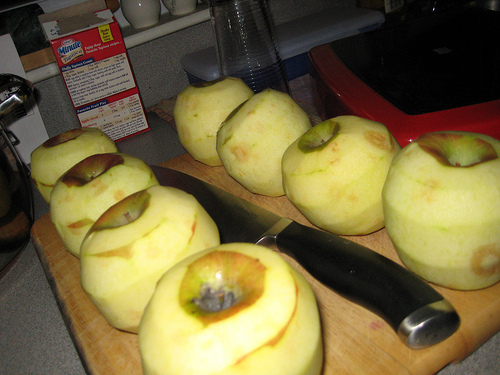 i am good with a knife for slicing,but i’ll need to pick up on of those slicers. thank you so very much.